Homeless people in Ipswich are being given free Thai Boxing lessons. Suffolk Police and Genesis Housing are paying for six months' worth of classes for people who stay at a hostel in Cavendish Lodge. Richard Godfrey, from the police's safer neighbourhood team, said the aim was to help people "achieve a more fulfilling life". "Residents are building confidence, increasing motivation, learning self discipline and reliance," he said. 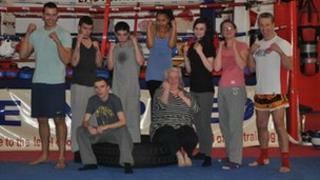 The classes are held at the Ipswich Kickboxing Academy and are attended by about 10 people each week. Gary Staff owns the academy and runs the sessions, which consist of exercises, sparring work with pads, and circuit training. "You can call it fighting but it's a sport and a good discipline - it's getting them healthy and putting them on a different road," said Mr Staff, a former semi-professional fighter. "Hopefully it will stop them from wanting to go out and booze it up every night." The idea of keeping the group occupied and given a focus is a key factor behind the scheme. Mr Godfrey, who takes part in the sessions, said he was drawing from his experience of joining the Army as a teenager. "That installed some discipline and motivation and I wanted to share it with these guys," he said. "There's a lot of potential in people who just don't realise they have it - this is about trying to draw that potential out by doing something they would never normally do." Jack Rolls, 21, has been out of work for a year and has been staying at the hostel for about seven months. "Coming here gives us something to do," he said. "There's always a danger that people sitting in a hostel doing nothing will get into drugs, violence and alcohol, but it's about having the strength to say 'nah' and coming down here and doing your thing. "It's free and not many things for us lot come free." Mr Rolls said the sessions had also been helpful in building relations with police. "When you're young all you see is police coming after you, and you don't know the reasons why," he said. "To have a police officer come along and help us out has helped open a few people's eyes up that the police are sometimes there to help you out." Fellow resident Emily Smith agreed that it had given her a new perspective on the police. "I had a horrible year last year - I went to prison twice and was in and out of the police station," she said. "This is helping me to focus." Melissa Hewitt, a support worker at Cavendish Lodge, said she had noticed a "big, big difference" in the people taking part in the sessions. "A lot of the time they haven't got much to do, as most of them are unemployed," she said. "When they come back they're a lot more upbeat, happy, raring to go and wanting to tackle life in general."